Thanks to the internet it streams all over the world, but Columbia and Greene county residents are lucky to be able to tune in WGXC, their own community radio station, right on their car or home radios (90.7-FM). On the air since 2011, the station serves up a 24/7 schedule of highly diverse music, transmission art, locally oriented talk, varying opinion, and other content. But being a volunteer-operated, community-supported operation with no commercial advertising, WGXC relies on the donations of its listening audience for its sustenance. Thus, the station holds regular pledge drives and fund-raising events. One of the latter is Lodge, a two-day happening that makes its fourth return to the charming Reidlbauer’s Resort on August 26 and 27. Lodge 2017 features two full nights of live music from Laraaji, Larkin Grimm, Pigeons, Kraus, Alexander Turnquist, Nick Millevoi, Lily and Horn Horse, Scratch Ticket, Devin Gary & Ross, and DJs Lunar Moss and Peter Brauch. Experimental sound artists Rory Solomon and Elia Vargas and others will present their works. Food, drink, and other on-site activities are available throughout the weekend, and the music will be broadcast live at wgxc.org. 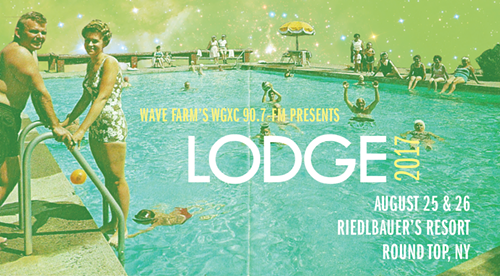 WGXC’s Lodge 2017 will take place at Reidlbauer’s Resort in Round Top, New York, on August 26 and 27. Tickets are $15 in advance, or $20 on each day of the event. For tickets, an event schedule, and more information, visit wgxc.org.